Skin cancer can be detected by physical examination of the body. If any unusual mole, scar or bump is found on the skin, one should contact a doctor as soon as possible for further investigation. There are several kind of skin cancers, some grow slowly and other grow too quick and can be life threatening. The post here provides brief information about the skin cancer detection and diagnosis, tests and physical examining treatment. Skin cancer can be diagnosed by physical examination and biopsy process. A sample of the skin (from the suspected area) is taken out and sent for further test to diagnose for cancer. The outermost layer of the skin is shaved with surgical blade and sent for further examination. A tool is used for this biopsy that helps in taking the deeper layer sample of the skin. This tool rotates on a particular (affected) area of the skin until it cuts down all the layers and then these skin samples are taken for further examining. 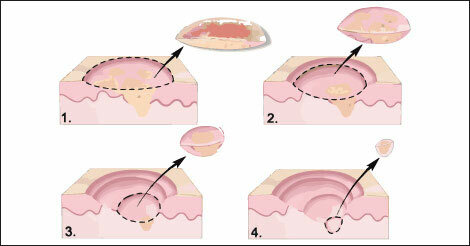 This process is used to examine the tumor that might have spread to the deepest layer of the skin. There are three majorly used treatments for the skin cancer removal. The treatments of the disease can also depend on the type of skin cancer. The skin cancer prognosis shows that the melanoma type of skin cancer is most deadly and difficult to treat among all the types of cancer. It is the process of removing the cancerous skin completely by a surgery. There three different kinds of surgery to remove skin cancer. The doctor numbs the skin and removes the cancerous skin and a small part of normal skin (margin). First the doctor removes the visible part of the cancer and some extra part of the skin that is suspicious for skin cancer. This surgery is performed by removing and examining each layer of the skin one by one till the cancer is removed completely. change to This surgery is generally used to treat the basal cells and squamous cell. In this process, the tumor is scrapped with a curette (an instrument use for surgery) and then gently cauterize (burn) the remaining cancerous cells with an electric needle. This process is usually repeated for three times. The process uses the immune system of the person going through the process to fight the disease. A cream is applied on the skin as directed by the doctor. The part of the skin where skin cancer is found is frozen, which destroys the part of the skin and slough off the cancerous cells. This therapy can be used in two ways, one for skin only and another if the cancer has spread through the skin to the organs or any interior tissue. This process has two phases, in first phase, some chemicals are applied on the skin and after several hours, in second phase, the cancer is exposed to a special kind of light that destroys the cancer. Usually, the process is used to treat the cancer which has spread to the large area of the skin or on the skin which is hard to remove. Cancerous cells are killed by the exposure in the high level radiation, repeatedly. Even though it is possible to diagnose skin cancer with physical examination, it is always advisable to have a preventive health checkup to check its severity. Full body checkup by Indus Health Plus will help you understand the possible complications before it gets serious. It can also help to detect the ailment before even the patient notices any significant change in body that is why it is called a preventive checkup. It helps us to act immediately. Wish to know more about the health checkup, fill up the below query form and we will assist you to be fit and healthy.